A recent study at The Scripps Research Institute (TSRI) shows that holes in HIV’s defensive sugar shield could be important in designing an HIV vaccine. It appears that antibodies can target these holes, which are scattered in HIV’s protective sugar or ‘glycan’ shield and the question is now whether these holes can be exploited to induce protective antibodies. In the 1990s, scientists discovered that HIV can have random holes in its protective outer shell of glycan molecules. However, until now scientists weren’t sure if antibodies could recognize and target these holes. Researchers had previously designed a stabilized version of an important HIV protein, called the envelope glycoprotein (Env) trimer, to prompt rabbit models to produce antibodies against the virus. In the new study, the plan was to reveal HIV’s vulnerabilities by examining where the antibodies bound the virus. “From work on HIV-positive individuals, we knew that the best way to understand an antibody response is to isolate the individual antibodies and study them in detail,” said Laura McCoy. To their surprise, when the researchers examined the rabbits’ antibodies, they found three rabbits had produced antibodies that targeted the same hole in Env. It appeared that antibodies could indeed target holes in the glycan shield. “This opened up a whole new concept,” said co-researcher Ozorowski. If the immune system was targeting this hole–preferring it to other vulnerable spots on Env–maybe holes would be especially important in designing vaccine candidates. 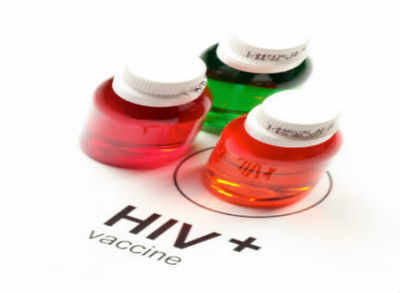 By analyzing the genetic sequences of thousands of strains of HIV, the researchers found that 89 percent of strains appear to have a targetable hole in the Env. The virus has a defense mechanism though, so it quickly mutates to fill in these gaps. The researchers speculate that future vaccines might prompt the immune system to create antibodies to target holes. “Targeting a hole could help the immune system get its foot in the door,” Ozorowski said. Alternatively, the holes may prove a distraction and should be filled in so the immune system can focus on targeting better sites for neutralizing the virus. Burton emphasized that this new understanding of glycan holes could help researchers narrow down the field of molecules needed in potential HIV vaccines. Ward added that this same method of ‘rational’ vaccine design, where researchers use a virus’s precise molecular details to prompt the immune system to produce specific antibodies, can also be applied to efforts to fight other viruses such as influenza and Ebola viruses.